Most joeys are ready to go to their new homes at 8 weeks OOP but may need a little longer. 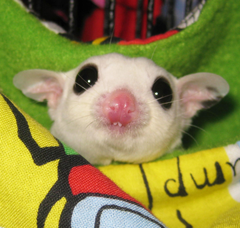 No joey will leave NH Sugar Gliders under 8 weeks OOP, we want to be sure our joeys are mature enough to be away from mom and dad and fully weaned so they can go home healthy and happy and thriving. A non-refundable deposit of 50% or $150 (minimum) for sugar gliders is required within 24 hours of agreement to purchase our joeys. Joey must be paid in full and picked up between 8-10 weeks out of pouch date. - NH Sugar Gliders unfortunately cannot adopt out to residents of illegal states, currently this includes Pennsylvania, Hawaii, California and Alaska. Please understand that we do this to not only protect our sugar gliders but also to protect you. - Male Joeys are available at pet only pricing. They will be neutered prior to going to their new home and the buyer is responsible for the cost of the neuter. Neuter price will be exact cost on receipt from veterinarian and neutered gliders must wait at least 72 hours before going home. All buyers are required to sign a contract to accompany deposit and a signed copy will be sent to the buyer within 7 business days. 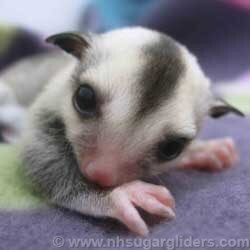 NH Sugar Gliders is proud to offer healthy, socialized joeys and all our joeys come with a 72 hour Health Guarantee. Please see our sugar glider contract for more details.